General information: links to web sites, journals, etc. VVOF-Vereniging van Verzamelaars van Oude Fondsen. Glasemann, Hans-Georg, vooraanstaand Duits scripofilist, die diverse geleerde werken schreef over het onderwerp. Sinds 2013 voorzitter van de Duitse scripofilisten vereniging EDHAC. Volg zijn interessante weblog. This society has almost 1000 members from approx. 50 countries. These members are listed annually in a Directory with addresses, e-mail, website, telephone and fax. The Society publishes a very interesting quarterly journal "Scripophily" with many articles, advertisements, a collector's bulletin board etc. It also organises mailbids regularly and monthly auctions in London at the member-meetings. Membership fee is $ 25 USA, 12 £ rest of the world. Discounts for multi-year subscriptions. An application form can be printed from this website. One can buy collecting albums in various countries and the albums they offer differ in size, quality and price. I have personal experience with the albums of the Belgian firm Boone Shares in Antwewerp (Belgium), and the German firm Kuerle Verlag. 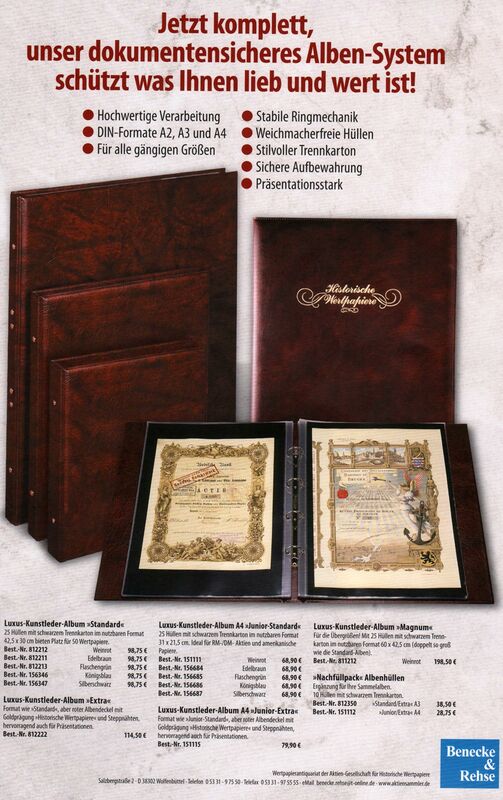 I have seen with other collectors the albums of the German firm Benecke and Rehse. Besides I have experience with albums that were once sold by the Dutch Collectors' Society VVOF and several other brands that I acquired as second hand. I do not wish to advice one brand or the other publicly although I have different experiences with each of these products. If you want my personal opinion, just ask. As with most products: one has to pay for quality. But the cheaper products may well suit the collector that is not carrying the albums around to bourses frequently and is not handling these very frequently. I invite album sellers to send me an ad or scan of their ads in journals or leaflets in order to offer the collectors society as broad a choice as possible here. Scriporama and First Dutch, better known by the name of the owner and director Kees Monen organises 2 times a year an auction, nowadays in Hotel Breukelen, easily reached by car or train (hotel can be reached walking from the train) , not far from Amsterdam. Prices at his auctions are often lower than those paid at German or Belgian auctions. Therefore these auctions may be worth while to monitor for German and Belgian colectors. Theiy are specialised in rare pieces worldwide, e.g., USA authographs. ca. 20 seiten A4 foormat. per april 2002 ca 600 Abonenten. A-4 size glossy quarterly with many interesting articles on ( amongst other topics) scripophily. ABC van het beleggen: alle beleggingstermen uitgelegd door Mr. Money ! Geert Leemeijer's site (in English and Dutch) is called "StockOld Scripophily": http://www.stockold.com. On this page one finds a link (Stockold Gallery) that shows scripophily of “Dutch internationals” such as Unilever, Shell and Philips and their forerunners. He has a sales list: “sale page” with items world wide, but also a section on Dutch Multinationals and a section with “Certificates from The Netherlands”. Email: geert@stockold.com. Karlheinz and Tina Kron (dealers) have a large website, with lots of information and regular auctions and sales lists. They have large lists of stocks for sale and they also help you selling stocks for a small commission. Wirtschaftsantiquariat Martina Berg publishes a website with many stocks for sale, ordered per country. They also have large lists with auctioneers, dealers, collectors etc. Klaus Rondot Historicals: http://www.hwp-info.com : books, bonds, shares and documents. http://www.scripophily.com is, I believe, the largest American site, run by Bob Kerstein. With their search machine you can find a particular company name (if they have it available) and companies related to any topic, world wide. They show pictures of all items for sale ! Besides many information pages that you may find useful. http://oldstockyard.com is another American site, run by William Harper, selling old bonds and stocks world wide, showing pictures of all items and very easy to navigate by country and topic. Terry Cox lists over 18.433 different USA Rail Road certificates, and gives a host of information. An absolute must for the advances USA Rail Road collector ! Go to Scripophily Corner (Minneapolis, USA) for about 100 pictures (as of August 22th 1999) of USA Railroads to look at or buy; many of them are < 1900. If your objective is to determine if a share can be redeemed in another existing firm, if there was a liquidation distribution, or if the share has only collectors value, then the Goldsheet Obsolete Securities Page may help you on your way. It is run by R Johnson. See the above website. And at http://stocksearchintl.com they will help research the potential economic value of your old uncancelled stock at a fee of $ 85 / company.